I’m not exactly sure where to start this post. I’ve been hiking for 12 days now and all I keep thinking about is how I can’t imagine hiking the trail alone (I know, I’m a solo hiker), but let me explain. My first day hiking was hard to say the least. Physically, my feet were in so much pain that I was practically limping by the end of the day. Mentally, I was exhausted, anxious, and wanted to bury myself in my tent. The last thing I wanted to do was socialize with other hikers. I realized later that night that I had eaten only 400 calories and drank only two liters that whole day. Needless to say, I wasn’t feeling too hot and really needed some support. Luckily, the next morning I ate some food and started to meet a lot of really cool people. I quickly realized that although I’m a solo hiker, hiking and experiencing the trail is A LOT more fun with other people. The best part is that even when I technically hike alone, I’m not alone. On the AT, people want to help and get to know one another. I couldn’t imagine doing a trek like this completely alone, which is why I’m glad I don’t have to. The trail is exactly what I thought it would be: welcoming and freeing. Throughout the next few days I managed to create a trail family. 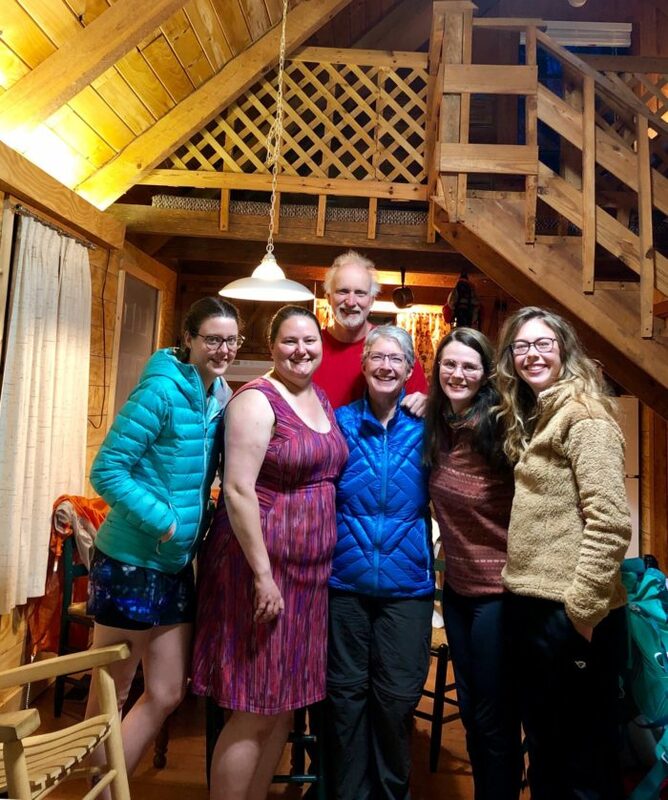 The six of us shared a cabin and have so far been able to stay together for the last 12 days. This trip wouldn’t mean as much to me if I hadn’t met these people. They help me understand who I am and why I’m really thru-hiking. Also, everyone knows pretty much everyone, and it makes things not only super convenient, but also super awesome. I was worried that after my first night at Hawk Mountain Shelter I wouldn’t see any of my tent mates, and boy, was I wrong. For the first week, I saw the same rotation of people every couple of hours. I’ve experienced trail magic three times combined with unbelievable hospitality, which was lovely to say the least. I made a last-minute decision to stop into Helen, GA, with my friends, and on the way there we stopped in Unicoi Gap. Lucky for us a church group had set up a table with hamburgers, hot dogs, water, etc. It seems like trail magic comes when needed the most. Each person out here has their own reasoning for wanting to hike the AT. The trail has a way of making a person feel welcome and at home, and that’s pretty damn cool. I can’t believe everything that has happened in the last 12 days, and I still have five months to go. I’ve realized quickly that thru-hiking is not only just a long hike but also a lifestyle, and I dig it. Hi Lexie, I enjoyed your article very much and will be looking for more from you as I haven’t yet decided if i want to hike the AT or the PCT yet, but also because of your intriguingly strong use of words. The way you described your trip-so-far brought me through a full range of positive feelings and vibes. “They help me understand who I am and why I’m really thru-hiking.” This one sentence brought me to tears. That is exactly why I’m planning my LDH. So it really resonated with me and, I hope I can meet people like that. It’s pretty convincing that the trail would offer the testing I want and the warmth my soul needs. When I was about 10 years old (25 yrs ago) I actually lived in a town right next to Helen, right on the Chattahoochee river. I would stare as we passed the same old tiny wooden sign on the way home from school everyday, “Canoe The Hooch” as the bus turned the corner headed for my unpaved road. It would be such a pleasure to revisit Helen, I enjoyed many good times there. Fun note: In my nomadic lifestyle, I thought the Chattahoochee country song was a local hit or something as it was released the year that I lived there. Glad your thru-hike is going well. Enjoy your tramily. They will come, go, come back again when least expected. Going ‘solo’ is the best! It makes you open to new tramily. Have the time of your life! Some of the nicest people backpack.